08.10.18 21:50 Transfer Sent Payment: 60.00 USD to account U18001600 from U1294xxx. Batch: 231460119. Memo: Shopping Cart Payment. 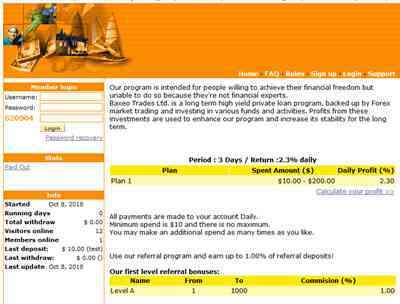 Deposit to Baxeo Trades Ltd. User allhyips. 10.10.18 11:12;Account;Receive;Received Payment 1.38 USD from account U18001600 to account U1294000. Batch: 231651636. Memo: API Payment. Withdraw to allhyips from Baxeo Trades Ltd.
11.10.18 11:35;Account;Receive;Received Payment 1.38 USD from account U18001600 to account U1294000. Batch: 231779656. Memo: API Payment. Withdraw to allhyips from Baxeo Trades Ltd.
12.10.18 10:36;Account;Receive;Received Payment 1.38 USD from account U18001600 to account U1294000. Batch: 231893707. Memo: API Payment. Withdraw to allhyips from Baxeo Trades Ltd.
13.10.18 10:41;Account;Receive;Received Payment 1.38 USD from account U18001600 to account U1294000. Batch: 232008056. Memo: API Payment. Withdraw to allhyips from Baxeo Trades Ltd.
14.10.18 11:31;Account;Receive;Received Payment 1.38 USD from account U18001600 to account U1294000. Batch: 232104104. Memo: API Payment. Withdraw to allhyips from Baxeo Trades Ltd.
15.10.18 12:05;Account;Receive;Received Payment 1.38 USD from account U18001600 to account U1294000. Batch: 232209074. Memo: API Payment. Withdraw to allhyips from Baxeo Trades Ltd.
16.10.18 20:24;Account;Receive;Received Payment 1.53 USD from account U18001600 to account U1294000. Batch: 232391834. Memo: API Payment. Withdraw to allhyips from Baxeo Trades Ltd.
17.10.18 19:35;Account;Receive;Received Payment 1.38 USD from account U18001600 to account U1294000. Batch: 232513377. Memo: API Payment. Withdraw to allhyips from Baxeo Trades Ltd.
18.10.18 19:52;Account;Receive;Received Payment 1.38 USD from account U18001600 to account U1294000. Batch: 232627733. Memo: API Payment. Withdraw to allhyips from Baxeo Trades Ltd.